This is a blog about the medieval hunt around late 14th century and our attempts to reenact parts of it. Our reasons for taking on this stems equally from our love of outdoor adventure, a lust for wine and cheese by the camp fire and an ambition to learn more about the medieval world by experimenting and experiencing. We both love the outdoors, but in medieval times rather few were actually out in the forest – it was considered a dark and fearful place. Soldiers, hunters and outlaws where the ones venturing out in it. We are situated in Sweden, a land with big forests and the right to roam free in them. Swedish law is excluding all medieval ways of hunt so we are concentrating on exploring other parts of the hunt. Behind this blog stands a small pack, two men and their Irish wolfhounds; Johan and his Boudica, Emil with his Basilard. 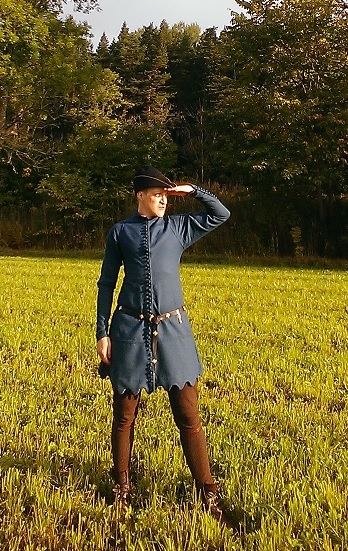 Johan has studied Historical archaeology in Lund university and is a medieval reenactor since over ten years. A member of St Huberts Rangers, a international group portraying medieval hunters and a founding father of Albrechts Bössor. Some time ago he tired slightly of the militarization of reenacment and wanted to explore other sides of it. Being a great lover for outdoor life in its simplest forms, and a larper since many, many years, it was a good way to combine it all in a whole. 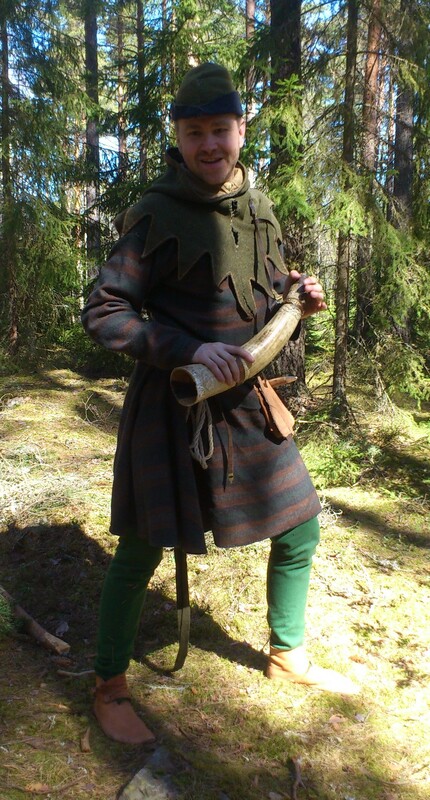 Emil to has a background as a larper and studied archaeology in Uppsala. His focus of interest has been that of learning and practising experimental archaeology and ancient technology as done at Bäckedal. Historical crafts such as plant dyeing, the tanning of leather and hides as well as spinning, weaving and sewing with traditional methods lies closest to his heart. In 2011 he plunged into 14th century reenactment as a participant in The Battle of Wisby 1361. Since then he has been involved as the projects blogger. 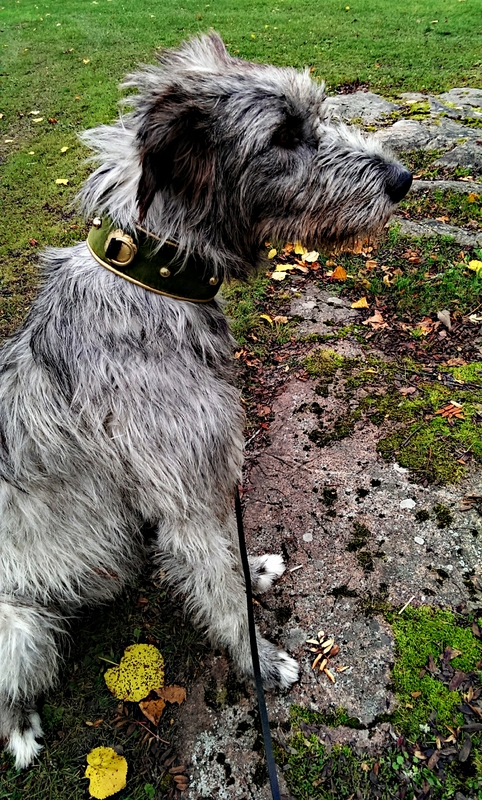 Boudica is Johans three year old Irish wolfhound, from Kennel Greirish. She is a bit shy (as all sighthounds..) and nor very smart or brave. She is a bit on the little side weighing only 50 kilos. She steals the heart of all she meets and is very concerned about right and wrong (that is… that the cats are allowed to do things she is not… ). She likes running after things in the woods, but not all to far from Johan. She knows just about three commands. Sit (works sometimes if there is a reward at stake) Wait (before eating) and Back (when she stands in front of the TV) . Mostly she also comes when you Whistle. The newest member of our pack was recently adopted by Emil. Basilard is a one and a half year old Irish wolfhound. He is not fully grown and much thinner than we want him to be, but already a big boy with his 56 kilos. Just like Boudica, he is a bit reserved towards strangers at first, but as soon as he gets to know someone, he wants to get close, offers a big tummy to rub or a wet kiss – he is possibly the biggest lap dog in the world! Basilard was “rescued” from a home where he did not get the love and care he should have had. Because of that, he came to Emil as a youngster and has a lot to learn. A calm, brave and warm personality, Basilard is eager to please. When he spots a hare, you can tell Basilard wants to be a great hunter, but he is yet to early in his training to be allowed to run free. Currently Basilard is busy making friends with Boudica and getting used to his new pack, but he is settling in just fine and we have great hopes for him. I very much enjoyed your blog, Exploring the Medieval Hunt. I am working on history book-blog of my own, which can be seen at [one word] theoryofirony.com, then clicking on either the “sample chapter” or “blog” buttons at the top. My Rube Goldberg contraption of a brain processes the world with an odd, well-caffeinated kind of logic: Why is there an inverse proportion between the size of the print and the importance of the message? History. Literature. Art. Science. Religion. I call this eccentric thinking the Theory of Irony and if your busy schedule permits, give a read, leave a comment or create a link. In any event, best of luck with your own endeavor. P.S. Sorry if this seems like spam, but it was indeed written by a real live history junkie. If the unsolicited nature causes offense, please delete with my apology. I have a question about signal horns… how are your horns attached to the shoulder straps? If you can, could you end or post a couple of photos? My name is Rodrigo Díaz. I´m from Argentina and I live in Cologne, Germany, where I work in the university as a Spanish teacher. I´m writing you because I have a question. I wrote a novel and I´m looking for a cover picture. At January 2015 you have posted a photo in your article “Those old hounds” that could be great for this porpoise. It´s the picture from a white dog with the title “Alaunts”. I wanted to ask, where did you found this picture and if you know how to get the rights to use it. This a mediaeval image, so I think that maybe I don´t need a permission, but I wanted to clarify this. There is going to be only 150 exemplars from this novel and I have not profit intentions. With the sells I hope to cover my expenses. Could you help me with this issue, please? Hmm… I have lost my computer that had that picture.. and i cant really remember where it was from. I think the one i found was rather small so it would not work well on a larger bookcover.